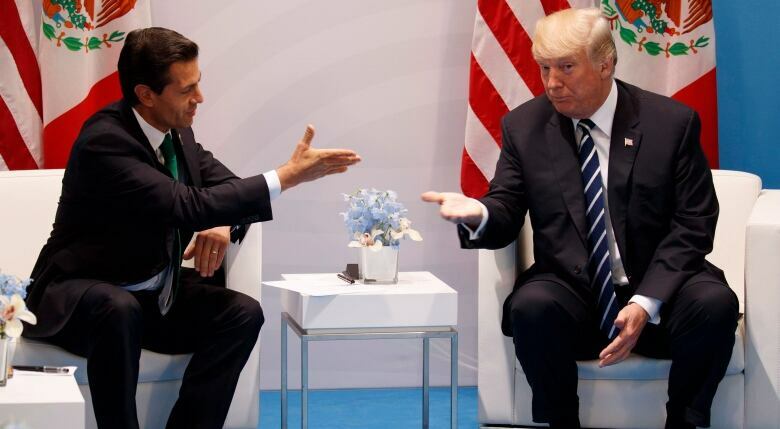 At the end of Mexican President Enrique Pena Nieto's social media video touting the free trade breakthrough between the U.S. and Mexico, he held up three fingers saying what Mexico really wants is a deal "between Mexico, the U.S. and Canada, in which we all win." That gesture echoed his comments Monday via speakerphone with U.S. President Donald Trump. Trump clearly wanted to use the moment to isolate Canada. But Pena Nieto didn't; in fact, he kept insisting that it's time to bring Canada into the deal. Was Mexico's leader living up to his commitment not to make a deal without Canada? Or was he trying to salve his guilty conscience, knowing he's already thrown Canada under the bus? In the early days, the question seemed to be whether Canada would throw Mexico under the bus and make a bilateral deal with the U.S. 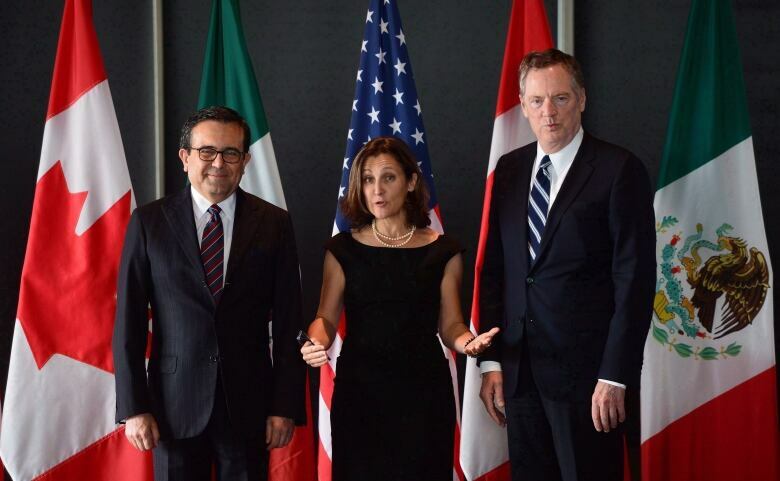 In February 2017, Mexico's Foreign Minister Luis Videgaray and its Secretary of Economy Ildefonso Guajardo visited Toronto and received reassurances Canada wanted to work with Mexico. "NAFTA is a three-country agreement," Canada's Foreign Affairs Minister Chrystia Freeland said. "Were there to be any new negotiations, those would be three-way negotiations." Former prime minister Brian Mulroney chimed in on CBC News Network's Power & Politics: "Throwing friends and neighbours and allies under the bus is a position for a weak leader," he told then host Rosemary Barton. "This is not the Canadian tradition." The Mexicans picked up on the ambiguity. 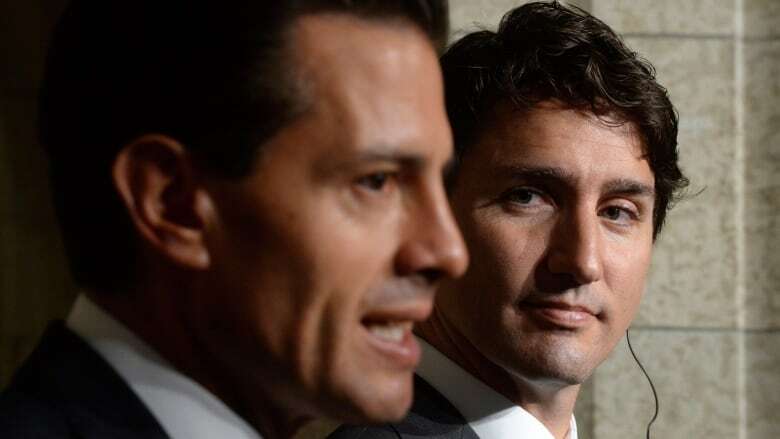 Mexico's former deputy foreign minister Andres Rozental wrote in the Globe and Mail that "Mexicans are also perplexed by some of the recent calls in Canada for 'dumping' Mexico from NAFTA and negotiating a bilateral deal with Washington. This is both short-sighted and a mistake." Trudeau continued to walk that line. Former Mexican president Vicente Fox said Trudeau's messaging left the Mexican side unsure how much it could count on Canada. Speaking to CBC Radio's The Current, he said Trudeau often spoke in favour of three-way deal, but "that was one day. "The other day he had to defend Canadian interests. And that's OK. It's business, it's trading and you have to look for a good deal, you have to negotiate, you have to concede and look to get good things back from the other." "At the very beginning Prime Minister [Justin] Trudeau said he would protect Canadian interests even if Mexico was not there. And at the end of the picture, it happened the opposite." In the early days of the Trump administration it was widely assumed Mexico would be the real target of the U.S.
"They're principally focused on countries that have large trade deficits with them," said Canada's ambassador to the U.S. David MacNaughton. "They haven't said anything specific about real problems they have with us." Trump's presidential campaign focused on Mexico and China as the trade villains stealing American jobs. Trump barely referred to Canada during the campaign, except to say "I love Canada" when asked whether he wanted a wall on the northern border. Few foresaw how Canada's dairy industry would become Trump's poster child proving that NAFTA is "the worst deal ever," as the president likes to call it. Nothing he said prepared his supporters for concluding a new free trade deal with Mexico, while leaving Canada on the sidelines — nothing has, really, been "concluded" with Mexico just yet, and Trump's base seems barely to have noticed the turnaround. It is no secret to anyone involved in the talks that the Mexicans were keener to get something signed than the Canadians, not least because Andres Manuel Lopez Obrador, a leftist, is set to become Mexico's next president. Having worked up his base over Canada's dairy tariffs, Trump may have concluded it made sense to reach a deal with Mexico and use that as a hammer to hit Canada — so he offered Mexico a deal it couldn't refuse. While current Mexican officials continue to express their hope that Canada will rejoin, Foreign Minister Luis Videgaray was blunt about his country's calculations. "There are things that we don't control, particularly the political relationship between Canada and the U.S., and we definitely don't want to expose Mexico to the uncertainty of not having a deal. Not having a trade agreement with the U.S., that's a substantial risk to the Mexican economy. Literally millions of jobs in Mexico depend on access to the U.S. market." Rozental, Mexico's former deputy foreign minister, told CBC Radio's As It Happens he regretted his country's rush to conclude a deal without Canada. "I believe that the Canadian government has put a brave face on what in effect is, from my point of view, a very unfortunate situation." "We decided that Mexico and the United States would negotiate, bilaterally, rules of origin for the automotive sector and Canada felt that it wasn't necessary for it to be at the table because it would benefit from whatever agreement was reached between the two of us. "What I don't think anybody expected was that right after having discussed the rules of origin for the cars, all of a sudden, we started negotiating bilaterally with the United States on everything else, on all the pending issues — sunset clauses, dispute settlements, intellectual property, governmental procurement etc., without the presence of Canada." Rozental says all three countries carry some of the blame for the situation but that it's Mexico's attitude that pains him. "I think that we, in Mexico, should have insisted on having Canada with us, because even when NAFTA was first negotiated, the Canada-Mexico partnership helped both of us a great deal in discussing with the United States proposals which we considered to be then and now unacceptable." Fox told CBC he hopes Canada and Mexico can continue to work together. "Usually, we get together when we're going to meet the elephant in the room between us. It's been useful for the two of us to defend ourselves together."